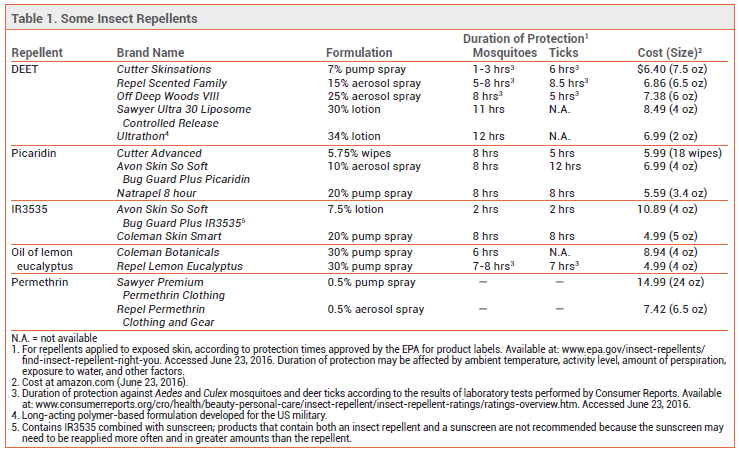 Insect Repellents | The Medical Letter, Inc.
DEET — The topical insect repellent with the best documented effectiveness against mosquitoes is N,N-diethyl-m-toluamide (DEET).4,5 Applied on exposed skin, DEET also repels ticks, chiggers, fleas, gnats, and some flies. DEET is available in concentrations of 5-100%. In general, higher concentrations provide longer-lasting protection,6 but increasing the concentration above 50% has not been shown to improve efficacy. Long-acting polymer-based or liposomal DEET formulations containing concentrations of 30-34% have been shown to protect against mosquitoes for up to 12 hours. The CDC recommends using concentrations ≥20% for protection against ticks. Adverse Effects – Toxic and allergic reactions to DEET have been uncommon, and serious adverse effects are rare. Rashes ranging from mild irritation to urticaria and bullous eruptions have been reported. Patients find that some DEET formulations feel uncomfortably oily or sticky on their skin. DEET can damage clothes made from synthetic fibers and plastics on eyeglass frames and watch crystals. Children – According to the CDC, DEET is safe for children and infants >2 months old; the American Academy of Pediatrics recommends using formulations containing concentrations of 10-30% in children. Toxic encephalopathy has occurred, usually with prolonged or excessive use in infants and children that sometimes included ingestion of the product. Adverse Effects – Picaridin can cause skin and eye irritation, but it appears to be better tolerated on the skin than DEET. It is odorless, non-greasy, and does not damage fabric or plastic; it can discolor leather and vinyl. Children – According to the American Academy of Pediatrics, formulations of picaridin containing concentrations of 5-10% can be used on children as an alternative to DEET. OIL OF LEMON EUCALYPTUS (OLE) — OLE (p-menthane-3,8-diol [PMD]), which repels mosquitoes, flies, and gnats, occurs naturally in the lemon eucalyptus plant. It is chemically synthesized for commercial use. In field studies against malaria-transmitting mosquitoes, OLE provided up to 6 hours of protection against mosquito bites.10 It is less effective than DEET or picaridin against ticks.9 OLE can be irritating to the eyes. Children – OLE products should not be used on children <3 years old. SUNSCREEN AND INSECT REPELLENTS — Insect repellents can be used with sunscreens; the repellent should be applied after the sunscreen. Applying DEET after sunscreen has been shown to reduce the SPF of the sunscreen, but applying sunscreen second may increase absorption of DEET. The CDC does not recommend use of products that combine a sunscreen with an insect repellent because the sunscreen may need to be reapplied more often and in greater amounts than the repellent. CONCLUSION — DEET-containing insect repellents can prevent mosquito and tick bites and are generally safe. Picaridin appears to be as effective as equivalent concentrations of DEET and may be better tolerated. Wearing protective clothing treated with the insecticide permethrin in addition to using DEET or picaridin on exposed skin may provide the best protection.